A few options for the upcoming long weekend. 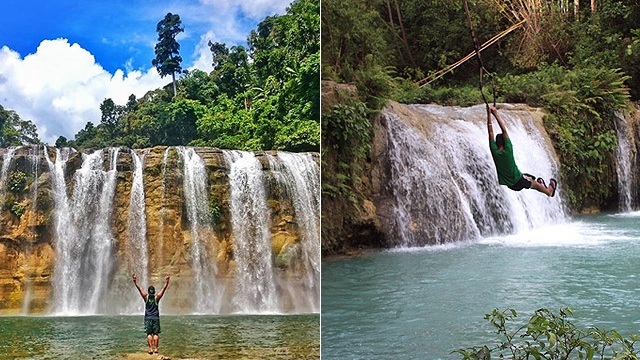 (SPOT.ph) With V-Day just around the corner and a long weekend coming right after it, a staycation seems to be a great idea for a Valentine’s celebration. Cozy up without leaving the city and without breaking the bank as we round up these staycation promos and packages. You’re welcome! 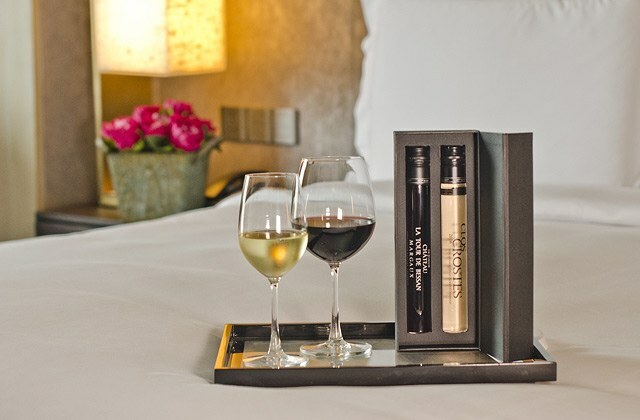 Enjoy a Valentine’s getaway in the midst of an urban oasis. 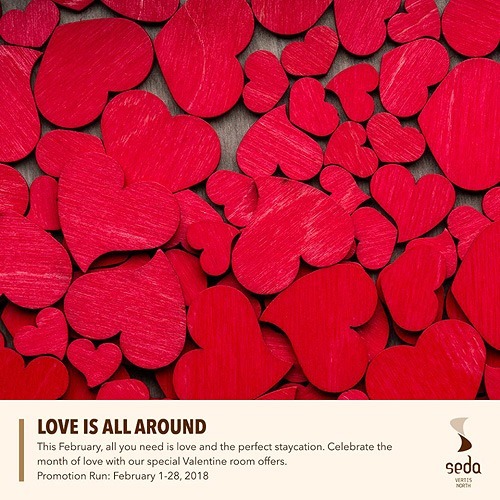 Edsa Shangri-La Manila’s weekend overnight stay for V-Day is inclusive of dinner by the poolside, a chocolate room amenity, and buffet breakfast for two at HEAT. Impress your bae with a great view of Manila Bay (see what we did there?) when you book at Bayview Park Hotel. 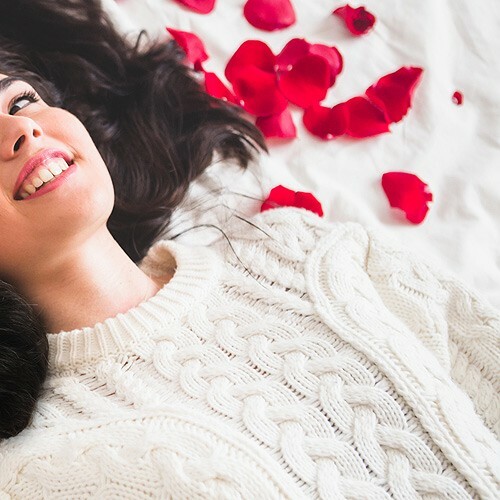 Their Romantic Valentine’s Treat Package includes an overnight stay for two with buffet breakfast, complimentary late check-out until 2 p.m., and an in-room massage. It also comes with a complimentary bouquet of flowers, a rose petals bubble bath, and a candlelit dinner with a complimentary bottle of wine for two. Rates start at P6,820 for the Superior Room and P7,820 for the Deluxe Room. Not free on V-Day itself? 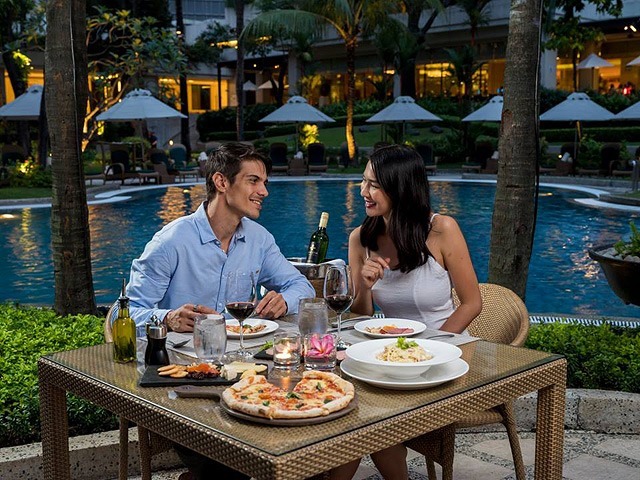 The Love Month at the Bay promo, which is inclusive of an overnight stay for two with buffet breakfast, a rose petals bubble bath, and a box of chocolates, runs all month long. Rates start at P3,988 for the Superior Room and P4,988 for the Deluxe Room. Waterfront Manila’s sweet treat this Valentine’s season comes in the form of a 35% discount. Just use the promo code BKLOVE to avail. The offer includes a buffet breakfast for two, and free use of WiFi, gym, and pool. The promo runs from February 9 to 28. 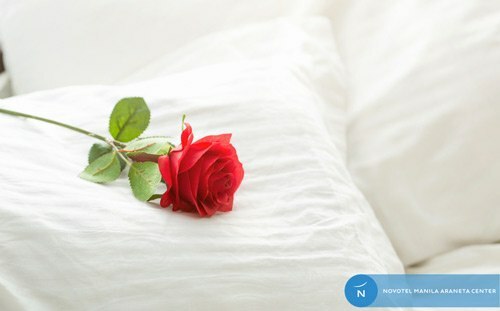 If you’re eyeing a staycation down south, Crimson Hotel Alabang has special room packages for February 14 only. The Be Mine Package (P6,300) is inclusive of an overnight stay and breakfast in bed, while The All You Need is Love Package (P7,650) is inclusive of an overnight stay, buffet breakfast at Café Eight, and a one-hour massage for two. 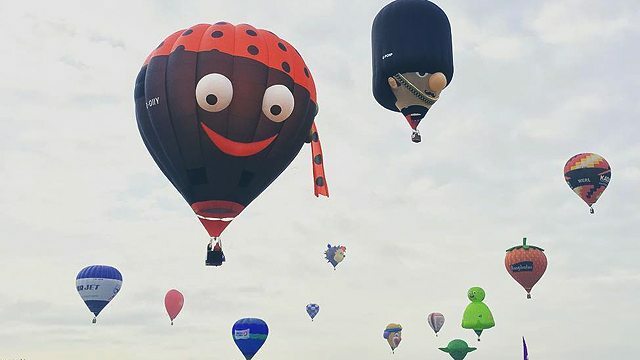 They also have a Grand Romance Package (P8,960), which is inclusive of an overnight stay, buffet breakfast at Café Eight, and a Dine Your Heart Dinner for two. All offers come with a Valentine’s surprise. 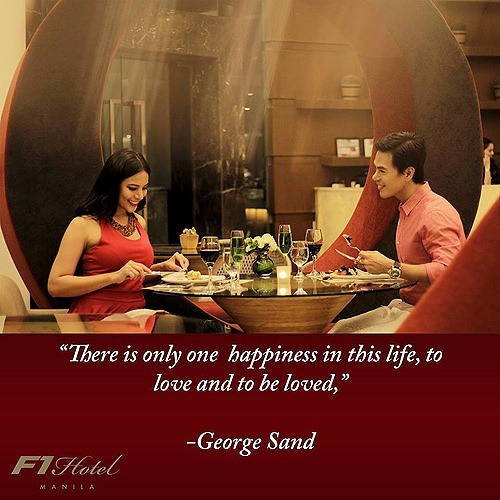 Love (and music) is in the air at F1 Hotel Manila. 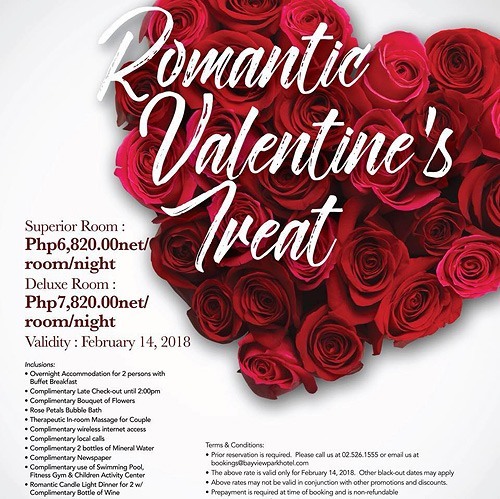 Their A Lot Like Love Room Package is inclusive of a stay in their Fort Suite with buffet breakfast for two, a welcome bottle of wine and chocolate sampler, and a P900 discount on their “Flavors of Love” Valentine concert happening on February 16. Spend a relaxing time with your special someone (or even with your family!) at Novotel Manila Araneta Center this month. 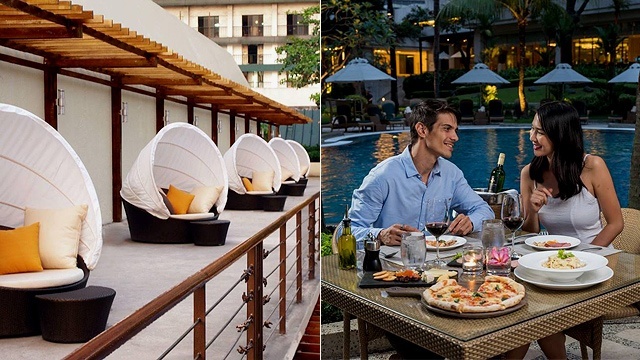 Their Love N Luck Staycation package includes an overnight stay and buffet breakfast at Food Exchange Manila for two adults and two children ages 15 and below, plus your choice of any of the following treats for two: lunch or dinner buffet at Food Exchange Manila or a one-hour Swedish/Combination Massage at InBalance Spa. This offer runs until end of February. It’s a “Sweet February” at New World Makati Hotel with their Valentine offerings. Choose from a Superior room (P7,500), Deluxe room (P8,500), Residence Club Deluxe (P10,500), or a One Bedroom Suite (P13,000) and enjoy the following: a breakfast buffet for two, late check-out at 4 p.m. (for stays booked on Fridays and Saturdays), a beautifully boxed pair of wine vials from WIT, as well complimentary premium Internet access, parking, and local calls. This offer covers bookings for February 14 and all weekends of the month. Treat your significant other to a room with a view of the bay. From February 1 to 15, Manila Hotel’s Valentine’s package is inclusive of buffet breakfast and a one-hour massage for two. 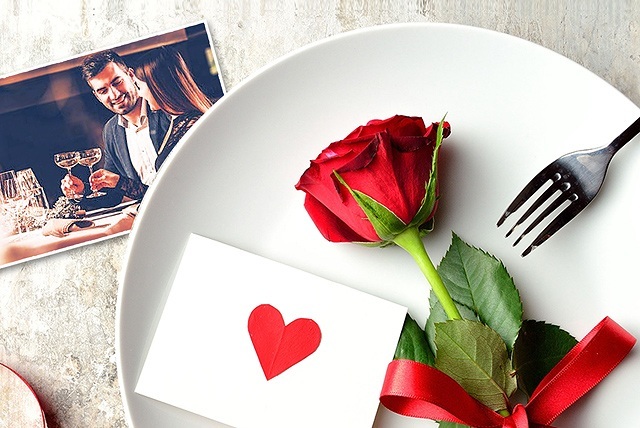 The hotel’s restaurant outlets also have special menus for Valentine’s, which you can also book ahead of time. Take your pick from two different deals when you plan your stay at Seda Hotel Vertis North. The One "Suite" Day Package is inclusive of an overnight stay in a Corner Suite Room, while the Dreamy Escapes Package include an overnight stay in a Deluxe (P8,700), Club (P10,200), or Premier / Corner Suite Room (P11,200). Both are inclusive of a massage for two at Seda Spa and P1,000 worth of credits at Straight Up Bar. This promo runs until the end of February. Has your valentine been naughty or nice? 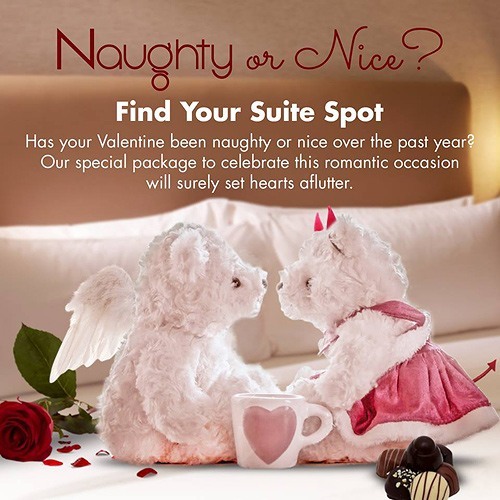 I’M Hotel’s Find Your Suite Spot package lets you choose between something Naughty (a novelty lover’s amenity pack) or Nice (a complimentary one-hour in-room massage) to suit your date’s fancy. Enjoy this add-on alongside the following: a buffet breakfast at Bloom for two, a complimentary welcome minibar, two servings of their Valentines’ edition cocktail and a dessert, as well as complimentary access to their Club Lounge and WiFi network. Plus, you can check-out till 2 p.m. for free. 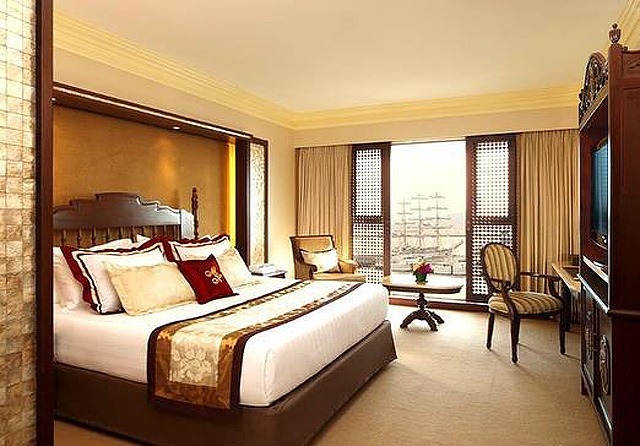 This package starts at P10,200 for a Premier Suite and P11,300 for a one-bedroom Executive Suite. You can also enjoy a three-course Love on Top dinner package at Antidote rooftop bar for stays on February 14—simply top up P1,500 each to avail.